The holy candelabrum. For Biblical Data See Candlestick. The Mosaic Menorah as Described in Rabbinical Literature. 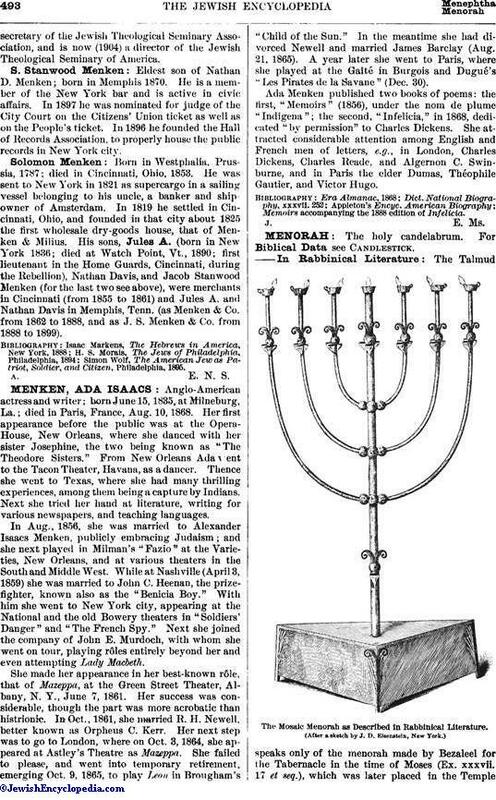 The Talmud speaks only of the menorah made by Bezaleel for the Tabernacle in the time of Moses (Ex. xxxvii. 17 et seq. ), which was later placed in the Temple(Tosef., Soṭah, xiii., beginning), between the ten menorot made by Hiram for Solomon's Temple (I Kings vii. 49). Each of these menorot was one denarius in excess of the required weight ("kikkar") of the Mosaic menorah (Men. 29a). 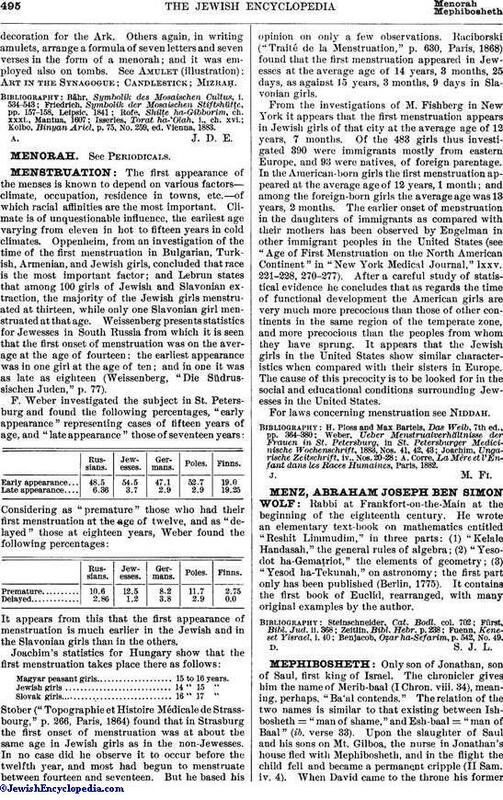 The Mosaic menorah, according to the Talmud, stood 18 "ṭefaḥim" (1 ṭefaḥ = 4 inches), or 72 inches, high, divided as follows: 3 ṭefaḥim for the tripod, including a "peraḥ" (blossom in relief); 2 ṭefaḥim space; 1 ṭefaḥ for a "gebia'" (cup or vase), "kaftor" (knob), and peraḥ; 2 ṭefaḥim space; 1 ṭefaḥ for a kaftor and branch on each side of the center shaft and a kaftor above the joint; 1 ṭefaḥ space; 1 ṭefaḥ for a kaftor and branch on each side and a kaftor above; 1 ṭefaḥ space; 1 ṭefaḥ for a kaftor and branch on each side and a kaftor above; 2 ṭefaḥim space; 3 ṭefaḥim for a cluster of three gebi'ot, a kaftor, and a peraḥ on each of the branches and the center shaft (Men. 28b). The gebia' is described as resembling an Alexandrian cup; the kaftor resembled the half of an apple; the peraḥ resembled a blossom carved on pillars. Altogether there were 22 gebi'im, 11 kaftorim, and 9 peraḥim (ib. ; see accompanying illustration). Maimonides further explains that the gebia' was broad at the top and narrow at the bottom (probably in the style of a flower-vase); the kaftor was somewhat egg-shaped with pointed tops; the peraḥ looked like a dish with the brim doubled outward ("Yad," Bet ha-Beḥirah, iii. 1-11). The spread of the branches was 9 ṭefaḥim (36 inches), and there was the same measure for the tripod ("Shilṭe ha-Gibborim," ch. xxxi.). 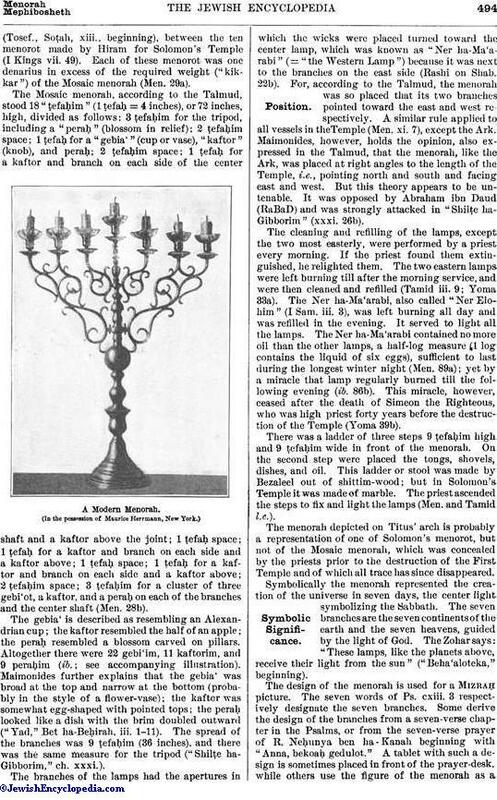 The branches of the lamps had the apertures in which the wicks were placed turned toward the center lamp, which was known as "Ner ha-Ma'arabi" (= "the Western Lamp") because it was next to the branches on the east side (Rashi on Shab. 22b). 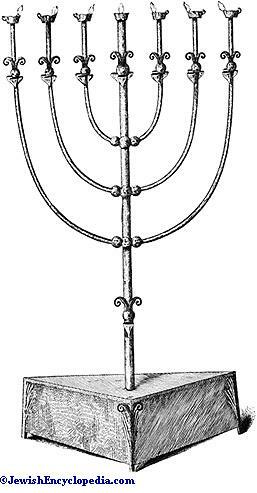 For, according to the Talmud, the menorah was so placed that its two branches pointed toward the east and west respectively. A similar rule applied to all vessels in the Temple (Men. xi. 7), except the Ark. Maimonides, however, holds the opinion, also expressed in the Talmud, that the menorah, like the Ark, was placed at right angles to the length of the Temple, i.e., pointing north and south and facing east and west. But this theory appears to be untenable. It was opposed by Abraham ibn Daud (RaBaD) and was strongly attacked in "Shilṭe ha-Gibborim" (xxxi. 26b). The cleaning and refilling of the lamps, except the two most easterly, were performed by a priest every morning. If the priest found them extinguished, he relighted them. The two eastern lamps were left burning till after the morning service, and were then cleaned and refilled (Tamid iii. 9; Yoma 33a). The Ner ha-Ma'arabi, also called "Ner Elohim" (I Sam. iii. 3), was left burning all day and was refilled in the evening. It served to light all the lamps. The Ner ha-Ma'arabi contained no more oil than the other lamps, a half-log measure (1 log contains the liquid of six eggs), sufficient to last during the longest winter night (Men. 89a); yet by a miracle that lamp regularly burned till the following evening (ib. 86b). This miracle, however, ceased after the death of Simeon the Righteous, who was high priest forty years before the destruction of the Temple (Yoma 39b). There was a ladder of three steps 9 ṭefaḥim high and 9 ṭefaḥim wide in front of the menorah. On the second step were placed the tongs, shovels, dishes, and oil. This ladder or stool was made by Bezaleel out of shittim-wood; but in Solomon's Temple it was made of marble. The priest ascended the steps to fix and light the lamps (Men. and Tamid l.c.). The menorah depicted on Titus' arch is probably a representation of one of Solomon's menorot, but not of the Mosaic menorah, which was concealed by the priests prior to the destruction of the First Temple and of which all trace has since disappeared. Symbolically the menorah represented the creation of the universe in seven days, the center light symbolizing the Sabbath. The seven branches are the seven continents of the earth and the seven heavens, guided by the light of God. The Zohar says: "These lamps, like the planets above, receive their light from the sun" ("Beha'aloteka," beginning). 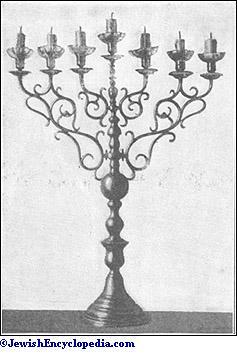 The design of the menorah is used for a Mizraḥ picture. The seven words of Ps. cxiii. 3 respectively designate the seven branches. Some derive the design of the branches from a seven-verse chapter in the Psalms, or from the seven-verse prayer of R. Neḥunya ben ha-Kanah beginning with "Anna, bekoaḥ gedulot." A tablet with such a design is sometimes placed in front of the prayer-desk, while others use the figure of the menorah as adecoration for the Ark. Others again, in writing amulets, arrange a formula of seven letters and seven verses in the form of a menorah; and it was employed also on tombs. See Amulet (illustration); Art in the Synagogue; Candlestick; Mizraḥ. Kolbo, Binyan Ariel, p. 75, No. 259, ed. Vienna, 1883.